Acupuncturists, Athletic Trainers, Chiropractors, Counselors, Dentists/Dental Hygienists, Dieticians/Nutritionists, Marriage & Family Counselors, Massage Therapists, Nurses, Nursing Home Administrators, Occupational Therapists/OTAs, Physical Therapists/PTAs, Psychologists, Respiratory Therapists and Social Workers. Set on 5 acres in a wonderful, nature-rich environment, students consistently comment that they receive so much more than CEUs and great learning. With our comfortable seminar room that overlooks a serene property including 3 outdoor walking labyrinths, waterfall, pond and scenic overlook, the center provides an environment for new thoughts and new awarenesses, while adding to your professional abilities. 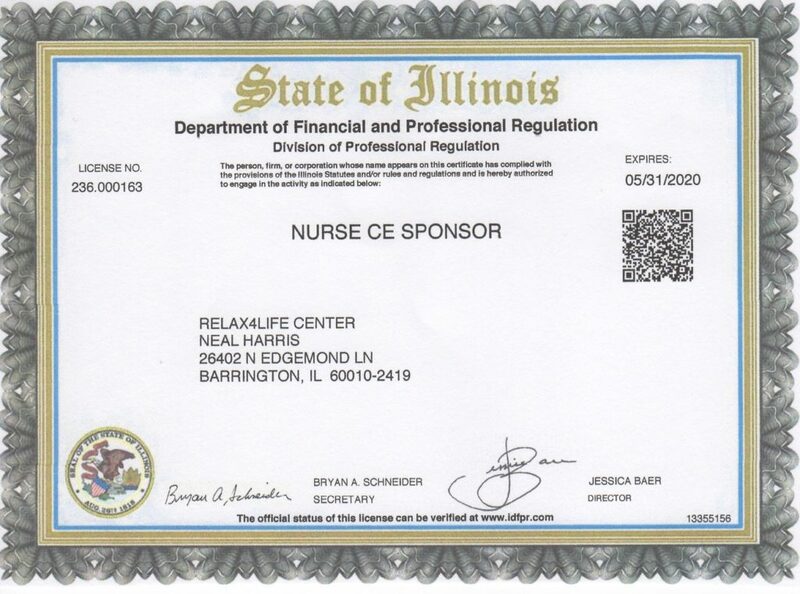 Relax4Life is licensed to provide CEs through The Illinois Dept. of Professional Regulation/Illinois Health Services Examining Committee under ID# 236.000163 (Illinois). All of our workshops are eligible for these CEs through 5/31/20. 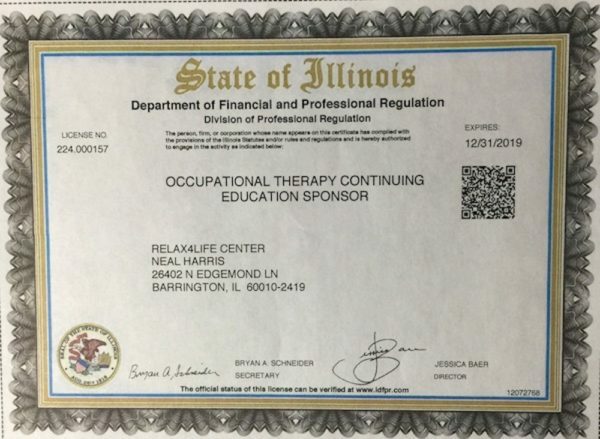 Relax4Life is licensed to provide CEUs through The Illinois Dept. of Professional Regulation/Illinois Social Workers Examining Committee under ID# 159-000698 (Illinois). All of our workshops are eligible for these CEUs through 11/30/19. 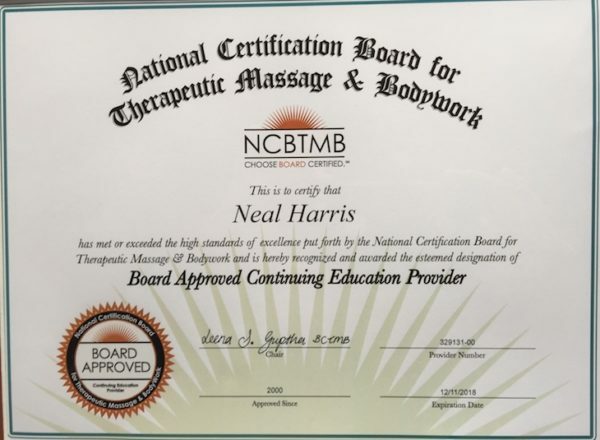 Relax4Life is licensed to provide CEs through The National Certification Board For Therapeutic Massage & Bodywork (NCBTMB) under ID# 329131-00 (national). Some of our trainings are eligible for these CEs through 12/11/21. 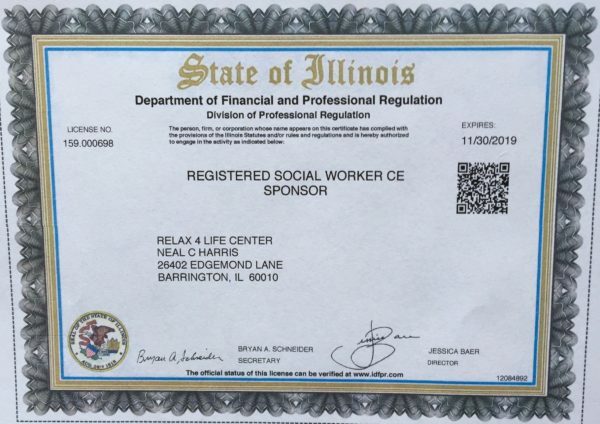 Relax4Life is licensed to provide CEUs through The Illinois Dept. of Professional Regulation/Illinois Health Services Examining Committee under ID# 224.000157 (Illinois). All of our workshops are eligible for these CEUs through 12/31/19.